Combine all the spices in a large bowl. Pat the chicken dry and put it into the bowl with the spices. Coat the chicken well, cover, and let stand for one hour. In a large, heavy bottomed skillet, heat the olive oil on medium heat. Add the chicken pieces, sprinkle lightly with salt, and brown, skin side down, for five to ten minutes or until the skin is golden. Remove the chicken from the pan. Lower the heat to medium-low and add the onions. Cover and cook for 10 minutes. Add the garlic and cover and cook for another minute. Add the lemon, olives, raisins, and 1/2 cup water (you may need more water as the dish cooks). 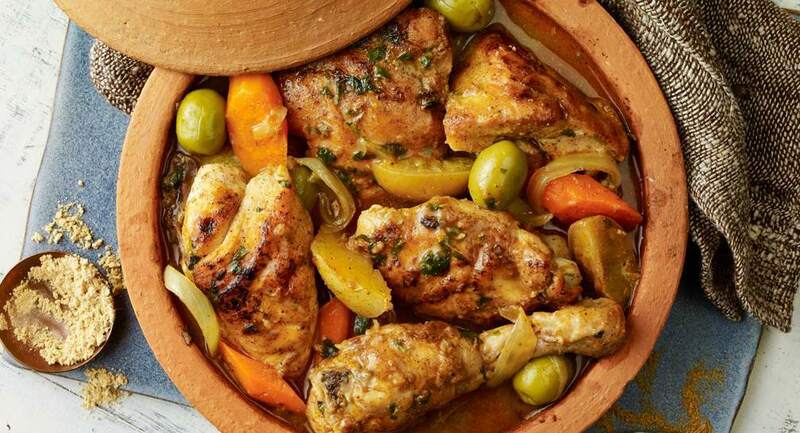 Add the chicken back to the pan, skin side up, nestling it among the olives and dried fruit. Bring to a simmer on medium heat, then turn the heat to low. Cover and cook for additional 20 to 30 minutes, until the chicken is cooked through. Mix in the fresh parsley and cilantro right before serving, and adjust seasoning to taste. Serve with couscous, quinoa, or rice. Either black or green olives will work well in this recipe.